Catalog | Auger Technologies Inc.Auger Technologies Inc. Catalog | Auger Technologies Inc.Auger Technologies Inc. The Alaskaug dirt auger is designed to deliver maximum value. The low initial cost, the rugged construction and drilling performance will significantly reduce your per hole costs. Alaskaug dirt augers are stock items and can be shipped the same day we receive your order. Rugged augers for use on digger derricks. Featuring heavy extra thick flighting and DOM center tubes for years of reliable service. Auger complete with kelly bar adapter, full set of teeth, and stowing dish. 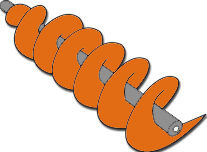 The Standard auger uses the 1030 black cutter tooth assembly. 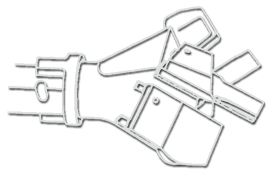 The Standard auger uses the 1030 cutter tooth assembly. The 9000 series boom type auger was developed for the toughest drilling conditions. The auger features extra thick flighting, DOM center tubes, rugged cast steel hex drive, and the efficient Alaskaug 9000 cutter head. 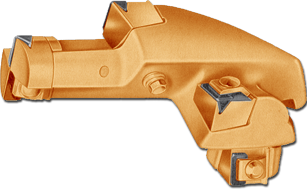 The 9000 series uses the 9020 cutter tooth assembly. Removable Block augers for pressure diggers. Please specify kelly bar size when ordering. Optimum augers for pressure diggers. Please specify kelly bar size when ordering. You no longer need to drag an air compressor to the job site to set a rock anchor or to drill a blast hole. 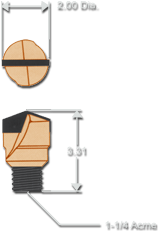 The S-130 blast hole bit will drill 2-1/4″ hole for larger anchors or for blasting. Augers will drill approximately 31″ deep. Extension will increase depth by 31″. Flight sections with 2-1/4″ female hex on lower end in 8″ through 36″ diameter. Pin-on heads with 2-1/4″ male hex in 8″ through 36″ diameter. Bars are 4140 steel. Female hex hub is 4140 steel casting. Bar only-drilled no female hub and complete bar with female hub available in 2″, 2-1/2″, and 2-5/8″. Standard kelly bars will be shipped from stock, normally the same day the order is received. Custome configurations will require 3 to 5 days for shipment. For Custom configurations, call us today! We will be happy to quote on your specific needs. Square kelly bar adapter. Please specify box size (from 2-1/2″ to 4-1/2″) and bar size for price quotation. 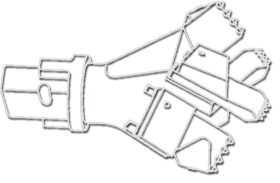 Reducer sleeve for square boxes also shown. Call for pricing today! Call Auger Tech today for a quote on any adapter needs you have!